JINGdigital: Brands Should Start Using WeChat Marketing Automation As Soon As Possible! Aaron Chang, founder and CEO of JINGdigital, China’s leading WeChat marketing automation platform, recently participated in an exclusive interview with Kuang Fu Data partner, James Eron. Aaron says that this is the best time for brands to introduce marketing automation technology. Marketing automation technology is the future of marketing; no matter what stage the brand is, it should take action now! Q1: Why did you choose to use WeChat as your main platform to create JINGdigital? WeChat is kind of like the swiss army knife of social media platforms. In the West, people require different socia media needs, that they satisfy using different platforms; in China, What’s App, Twitter, Youtube, Paypal, Instagram, and other platforms have been merged together to form “WeChat”. People living in China, along with the rest of the world can share their lives through WeChat, scan QR codes to get brand coupons, read daily information, buy goods, pay for utility bills, and more. Since the launch of WeChat in 2010, it has attracted more than 900 million loyal users. People spend an average of 90 minutes a day on WeChat, while heavy users spend about 4 hours a day. We chose to use WeChat as the main platform to create JINGdigital, an automated marketing platform. This choice was due to WeChat’s unique user base in China and because WeChat’s open interface is extremely unique and advanced, creating better experiences for followers. Q2: Why is WeChat important for brands? Every action of WeChat is based on “user permission”; users can start a chat or pay attention to a brand public account if they want to receive continuous brand information. Therefore, compared to the one-way output of traditional advertising, the launch of the WeChat “Public account” has become the best venue for official brand communication with consumers. Today, most brands have created their own WeChat official account and have obtained a certain number of followers. Now, brands must achieve a greater understanding of followers, which will help the brand get more value from these followers and form more effective interactions with them. This is the purpose of JINGdigital. Our WeChat marketing automation technology can help brands understand every potential customer and icrease their purchase conversion rate. Q3: How does JINGdigital work in brand marketing strategy? Right now is a perfect opportunity for JINGdigital to play a role in all brands that are rooted in the Chinese market or are entering the Chinese market. It is clear that WeChat is an indispensable channel, as evident in its opportunities for digital marketing. Creating WeChat public accounts and aqcuiring fans completes the first phase of WeChat marketing, JINGdigital can help the brand upgrade to the second stage: use marketing automation technology to collect user information, track user behavior, complete docking with the brand’s original CRM database, and shape the 360° follower portrait. These actions pave the way for the WeChat 3.0 phase: creating a personalized journey for each individual follower and forming a “strong relationship” to improve purchase conversion rates. Referring to the technical level, JINGdigital’s marketing automation platform can label all actions that followers perform within the official account (such as the chat between the follower and the chat bot in the WeChat service account, the follower’s interactions, and messages in the customer journey). JINGdigital can record effective information to form the follower portrait so that the brand can truly understand the individual image of the user and easily design personalized interactions using automation. JINGdigital is very fortunate to have the privilege to work with many big brands across all industries. Through continuous trials, we observed that the above operations in WeChat bring the brand and the customer closer together. These marketing strategies will gradually become the most popular and successful method for brands to contact Chinese consumers. Q4: In your experience, what is the right and wrong way to market to potential customers? If your brand has a membership program and wants to build stronger relationships with loyal or potential customers, it is a good idea to do so using your brand WeChat public account. Using this method, you will get more customer responses and increase customer loyalty. Recently, we have partnered with a luxury brand to compare the “Email and WeChat interactions with recent consumers”. The results show that the number of consumers who complete the interaction using WeChat is 10 times higher than that of e-mail: an e-mail response rate of 6% and a WeChat response rate of 60%. If you are a brand and want to build more and stronger relationships with your customers, then it is a good choice to achieve this using WeChat. One of the worst things to do is to send the same message to each user. Today, the attention of people is very limited. If you receive content that you don’t care about for a long time, you are eventually going to stop paying attention to the brand account. The brand attracts new fans through offline activities and after the event, the new followers have a 70% clearance rate. This is a typical negative example. In response to this phenomenon, JINGdigital launched a chat bot that initiates an automatic dialogue after the follower’s attention is first grasped. This chat bot will understand the follower’s needs and record it, following this up by sending customized content to the follower based on the tag. When this process is used, the brand’s official micro-reduction rate is reduced by 20%, and the post reading rate is increased by 30%. Therefore, in this era of attention economy, brands want to attract more followers and establish strong relationships with potential customers to understand the individual users and send them the information that TA is interested in and needs. Automated marketing technology can help brands perfectly balance the relationship between “the value that the brand provides to consumers” and “the value that consumers bring to the brand”. Q5: What advice do you have for brand managers? I talked about the maturity of social WeChat marketing in three phases. 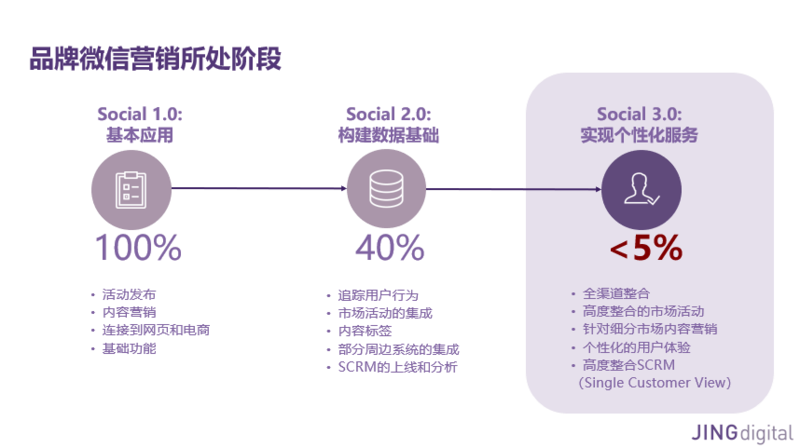 In the first stage, the WeChat public account has just been established; in the second stage, a marketing automation platform or social CRM can be established to collect data and make personalized interactions; in the third stage, implement personalized content for customers based on the data collected in the second stage. Our advice is that you should take action now! Marketing automation is an improving process that is applicable to any brand that establishes a WeChat public account. If you start experimenting early, the data will be much more comprehensive when it is needed. The value of marketing automation technology for brands and users is increasing everyday. A little personalization of content can make a big difference for consumers. Q6: What is the best way to contact you? You can search for JINGdigital WeChat public accounts to experience personalized interactions.